Find out what you need to know about investing in emerging-markets funds. A map showing the world's developing countries. Source: Wikimedia Commons user Mceder. U.S. investors have historically been wary about investing their hard-earned money in companies based in foreign countries. But given the huge returns available from stock markets in developing countries over the long run, more investors have gotten excited about adding international exposure to their portfolios. In particular, according to figures from Aon Hewitt, the number of corporate retirement plans offering emerging-markets funds doubled from 2011 to 2013; fully 30% of all employer-provided plans now make such funds available to employees. Let's look at emerging-markets funds and whether you should include them in your own portfolio. Emerging-markets funds are mutual funds and exchange-traded funds that concentrate on stocks in countries with emerging economies. That designation stands in contrast to developed economies, which include most of Western Europe, as well as the U.S., Canada, and Japan. The idea behind investing in emerging markets is that their economies are expanding more quickly than those of developed markets, creating the dynamic economic conditions to support fast-growing companies that have solid chances of success in the global economy. When emerging-markets funds first became popular, most restricted themselves to the four primary emerging economies: Brazil, Russia, India, and China, collectively referred to as the BRIC countries. But more recently, investing in emerging markets has gone beyond the BRICs to include even smaller stock markets in areas of Latin America, Africa, Eastern Europe, and Asia. Therefore it's important to look at exactly what investments a given emerging-markets fund holds in order to get a sense of the fund's scope in making investments around the world. China is a key emerging market. Source: Wikimedia Commons user Michel_r. Emerging-markets funds can be based on active or passive investing principles. Some funds track benchmarks of emerging-nation stock markets, while others hire professional stock-pickers to select the best prospects from a given applicable market. What is the history of emerging-markets funds? Emerging-markets funds have existed for more than 25 years, with the Templeton Emerging Markets closed-end fund claiming the status of the first emerging-markets fund available to U.S. investors. In 1994, Vanguard opened its Vanguard Emerging Markets Stock Index Fund (NYSE:EMF), an open-end mutual fund that passively invests in an index of emerging-markets stocks across more than 20 countries. Exchange-traded funds covering emerging markets arose over the past decade, and they were enormously popular in attracting assets to take advantage of the spike in returns. Specifically, the Vanguard FTSE Emerging Markets ETF (NYSEMKT:VWO) and the iShares MSCI Emerging Markets ETF (NYSEMKT:EEM) were instrumental in opening investors' minds to the idea of emerging-markets funds. How many emerging-markets funds are there? There are hundreds of different emerging-markets funds, covering not only stocks but also sovereign and corporate bonds. According to a report from the Boston Consulting Group, emerging-markets funds' collective assets under management rose from $2.5 trillion in 2002 to $6.4 trillion in 2012, far surpassing the growth of the overall global stock market over that span. In the ETF world, the Vanguard and iShares emerging-markets funds dominate their competition, with $66 billion and $44 billion in assets, respectively. But just about every major mutual fund and ETF family has its own proprietary set of emerging-markets funds in order to offer a well-diversified portfolio to their investors. Why invest in emerging-markets funds? 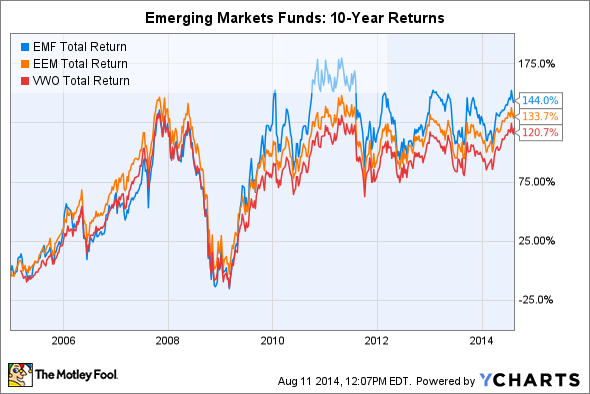 Emerging-markets funds have a number of attractive qualities. Most notably, because economic growth is still occurring at a rapid pace in those countries, the companies that benefit from increased economic activity have hyper-growth opportunities that their larger and better-established counterparts in the developed world have already put behind them. Admittedly, many U.S. companies have made emerging markets a vital part of their overall growth strategies, but in many cases, local companies with almost no international reputation have huge competitive advantages thanks to an established customer base within those economies. Brazil remains in the emerging-markets investing spotlight. Source: Wikimedia Commons. At the same time, emerging-markets funds simplify international investing. Buying individual international stocks can be difficult even in developed markets, and getting direct access to foreign stock markets in emerging-market nations requires substantial effort between finding an appropriate broker and dealing with issues such as currencies and additional fees. By contrast, buying an emerging-markets fund is as simple as investing in any ETF or mutual fund. While expense ratios tend to be higher than those of domestic stock funds, the overall price is often a fraction of what you'd pay to establish your own diversified portfolio of emerging-markets stocks. If you want exposure to some of the most rapidly evolving economies in the world, investing in emerging markets is a must. Emerging-markets funds make it simple to get exposure to those fast-growing areas of the world without having to buy shares of little-known individual companies that don't even list their stocks on major U.S. exchanges.